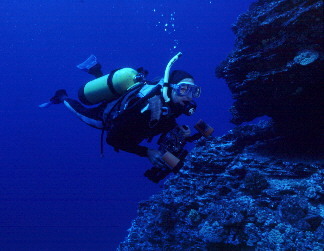 Nudibranchs of the family Dendrodorididae possess a long sucking tube with which they feed on sponges; there is no radula. Some are quite large. D. albobrunnea is of moderate size, usually brownish or grayish with a double row of almost starlike white blotches along its back and a ring of smaller white blotches at the edges. Outside Hawai`i it can be whitish with brown blotches. (These may be two distinct species.) Some authorities identify this slug, or something much like it, as D. elongata Baba, 1936. 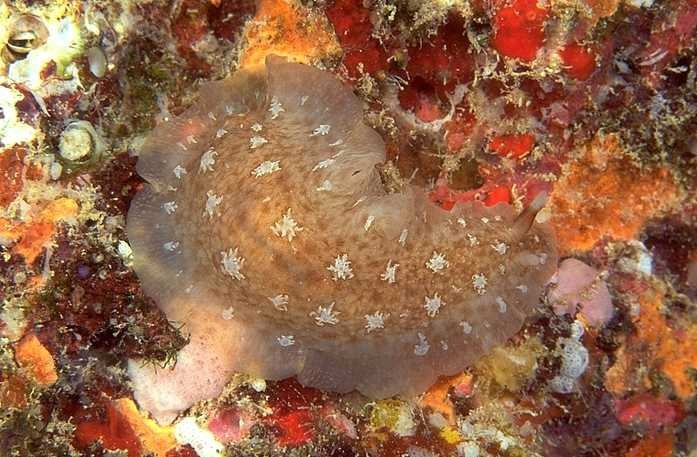 See Bill Rudman's Sea Slug Forum. It occurs from the shallows to at least 50 ft. To about 3 in Indo-Pacific. Photo: Kea`au Beach Park, O`ahu. 40 ft.